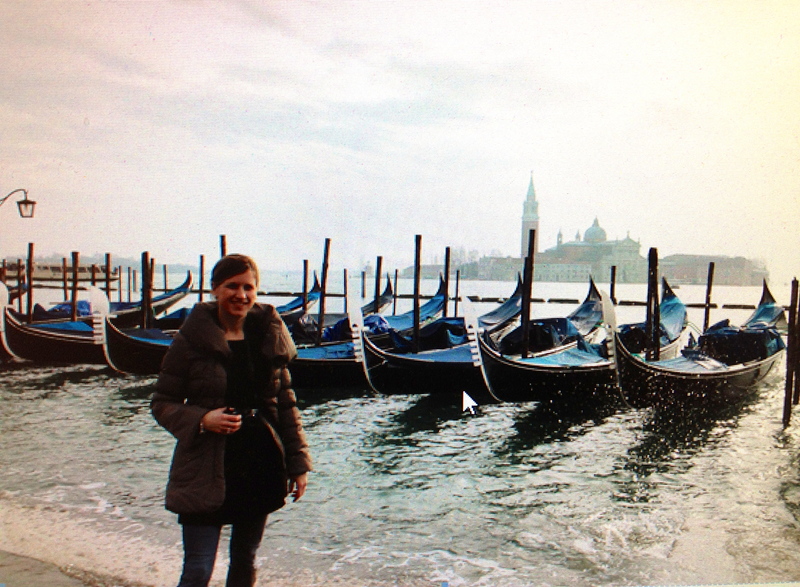 There is nothing quite like wandering aimlessly through the labyrinth that is Venice. For two days, my friend and I flowed to the rhythm of the city. We got lost – that’s a must. 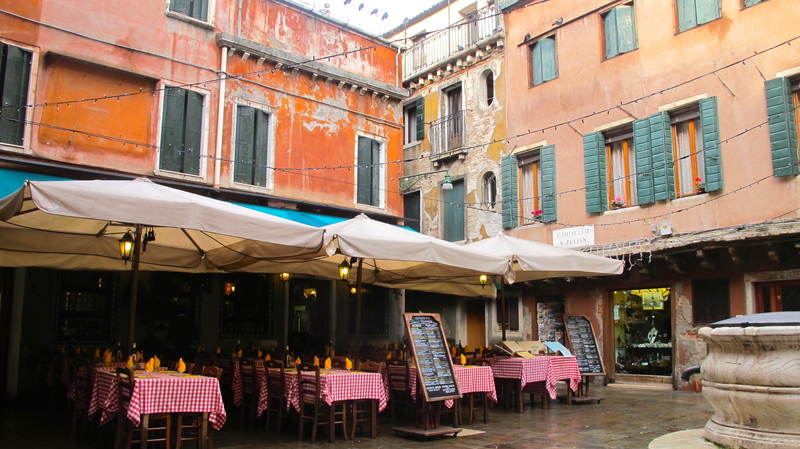 We ambled down narrow streets from palace to piazza, shopping for souvenirs, watching as gondolas silently slide by in the teal colored water, and marveling at the ornate churches and charming squares. 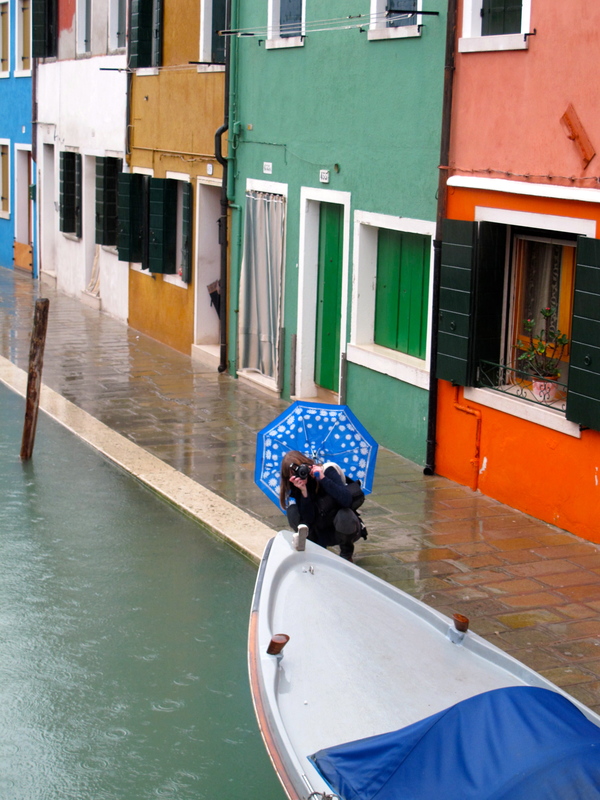 It was acqua alta, or high waters, in Venice. 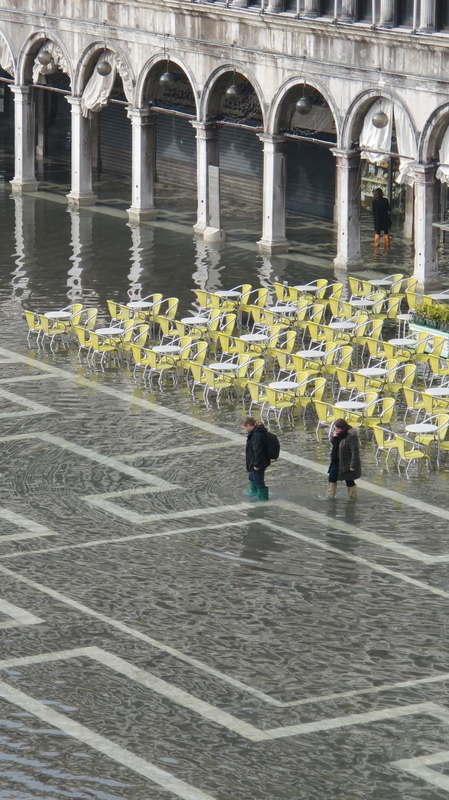 When the main square is flooded, the city pulls out planks for people to walk on to enter St. Mark’s church. It’s a worthwhile attraction to go inside the church museum. 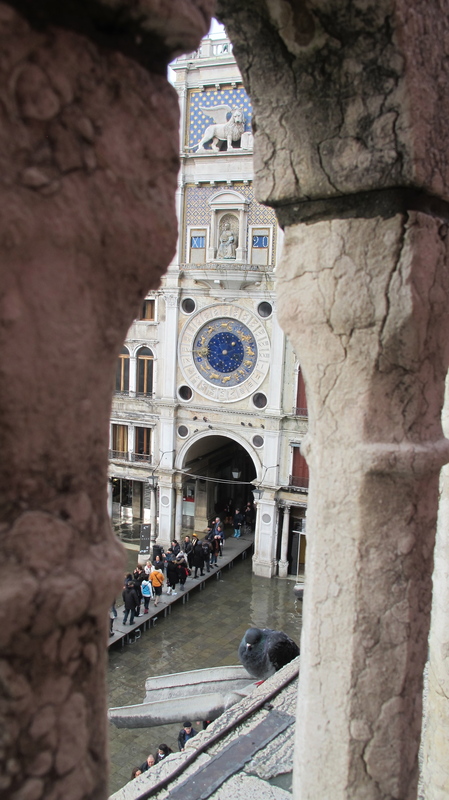 We took the the narrow and steep staircase inside St. Mark’s, which granted access to the roof overlooking the square. Breathtaking views. The famous four horses are housed there. 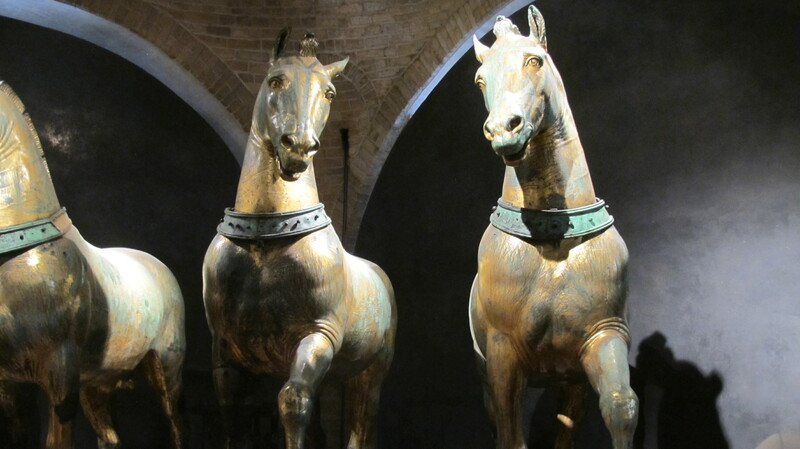 These horses were looted several times before finding their way back to Venice. (Napoleon snaked them in 1797 when he conquered much of Italy). 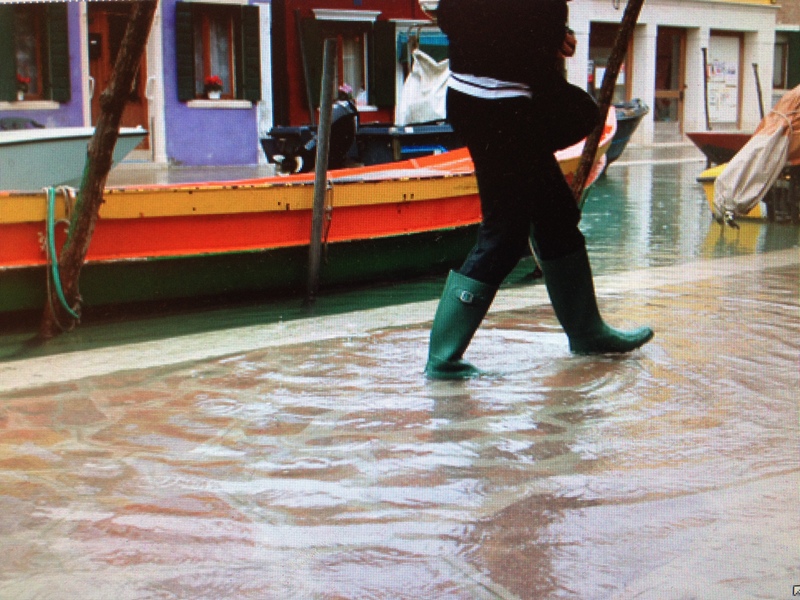 I was glad I brought my rain boots, so I could stomp like a kid in the high water in the Piazza San Marco. 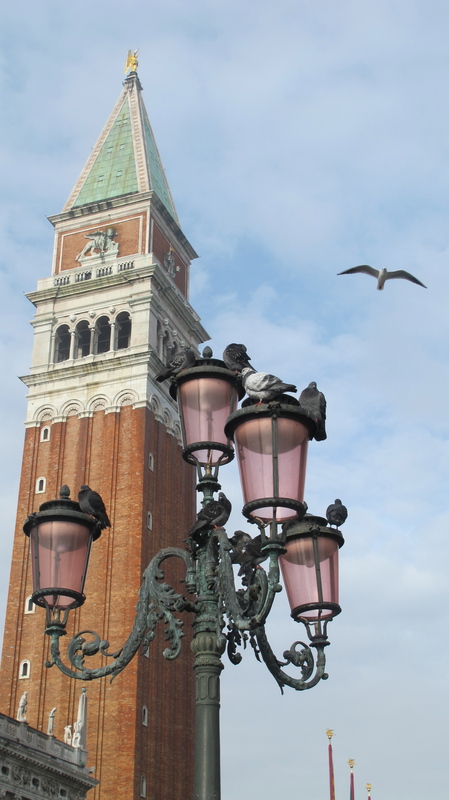 I’m a total cheese, and wore my bird dress in honor of all of the pigeons looming around St. Mark’s Square. or at least didn’t try to land on me around the Campanile. 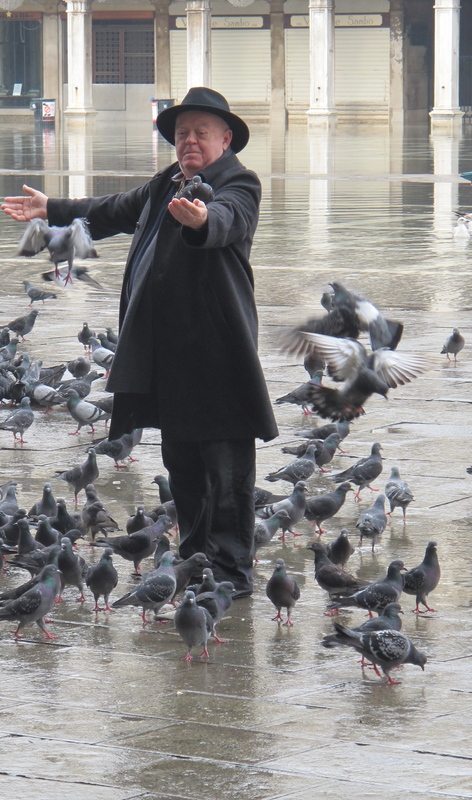 Unlike this man, he was a pigeon whisperer. 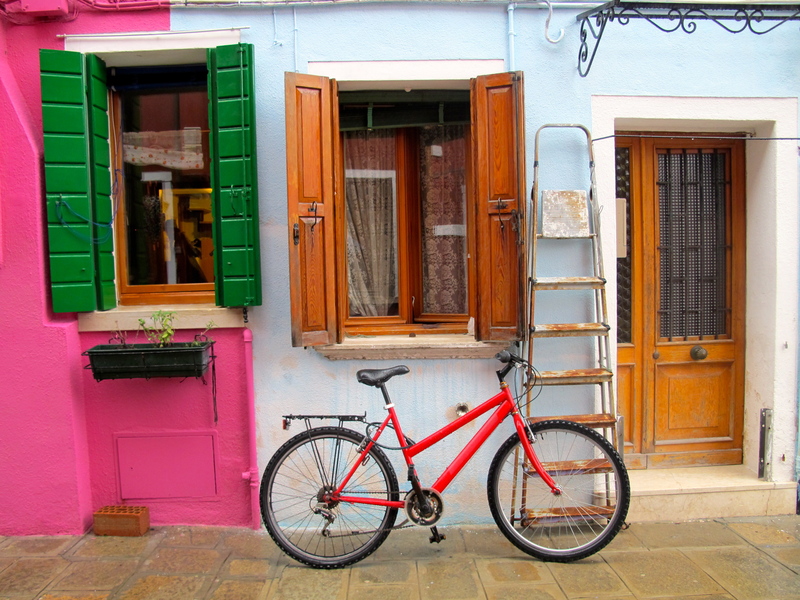 In Venice, you soak up the sights at every turn. I quite enjoyed eating gelato while walking over the Rialto bridge. Lean out over the bridge, the view is like no other. 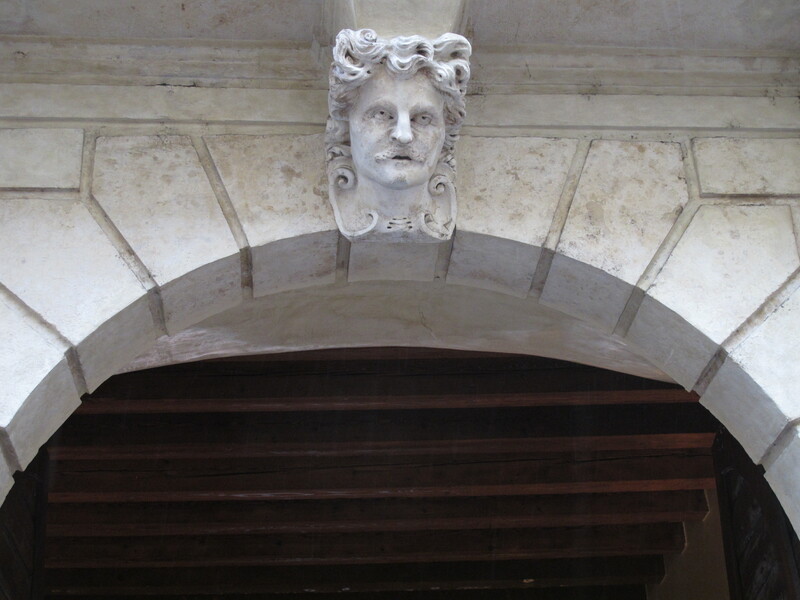 We took an insider’s tour of the Doge’s Palace, which I’d say is a must do. 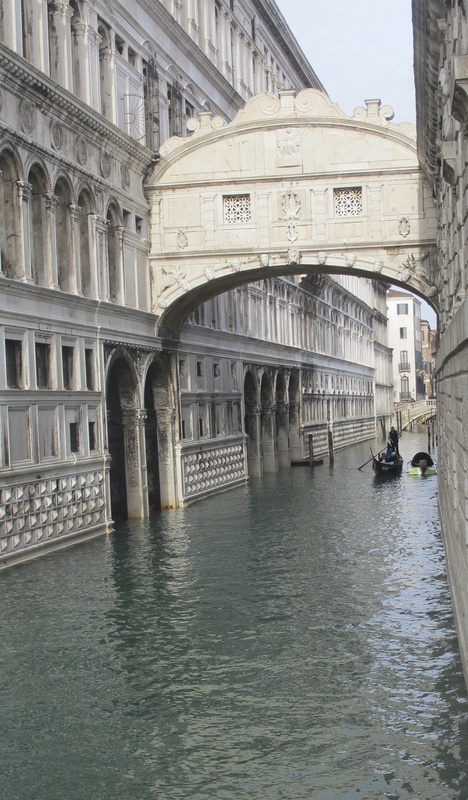 This tour is the only way to walk across the Bridge of Sighs. 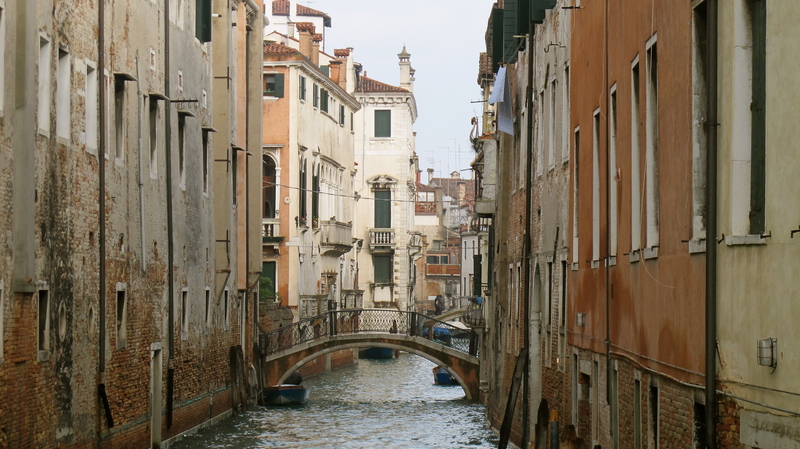 This is the very bridge that prisoners crossed – giving them their last view of Venice – before going to prison or being executed. Casanova was incarcerated here, before he escaped. He literally walked out the front door. It’s a cliche, si! ! It’s overpriced, assolutamente. 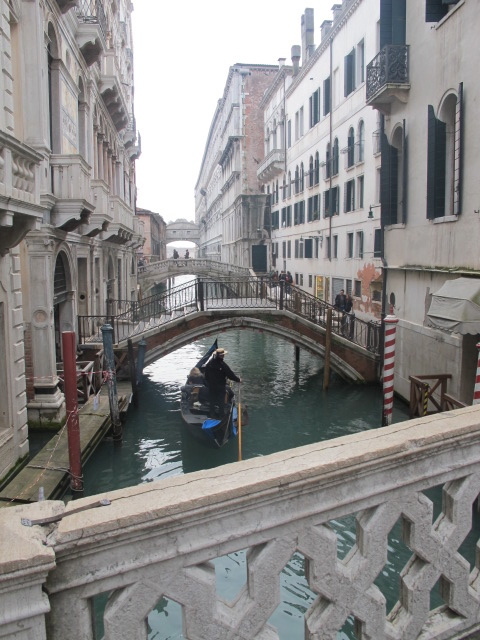 But gliding through the canals in a gondola is a flash to centuries past ,and worth the price tag (80 euros). 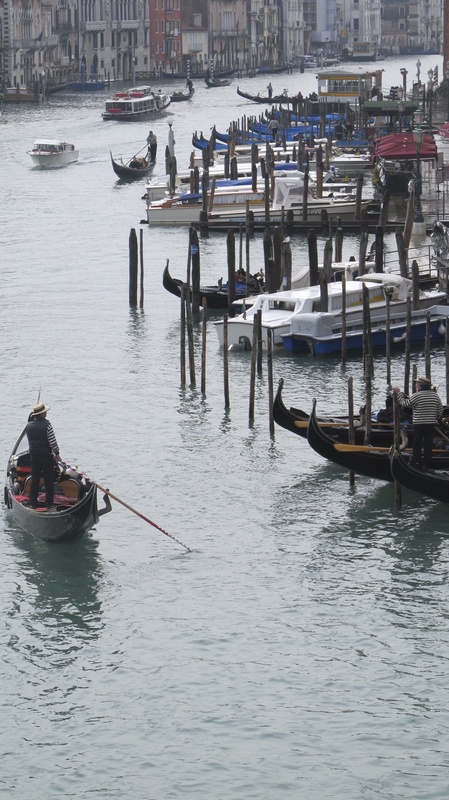 These traditional boats have transported people around the Venetian waterways for more than 10 centuries. 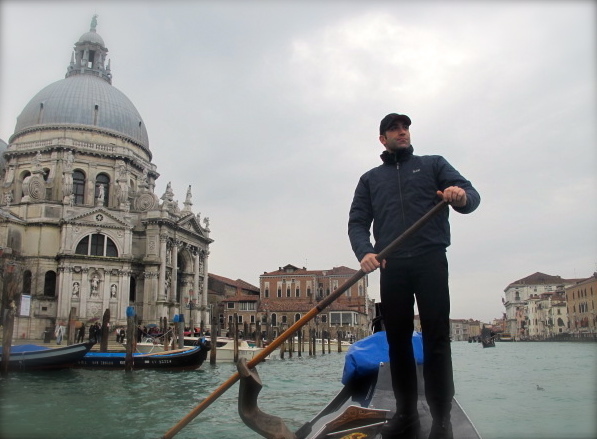 Failing to take a gondola ride is like going to Paris and ignoring the Eiffel Tower. 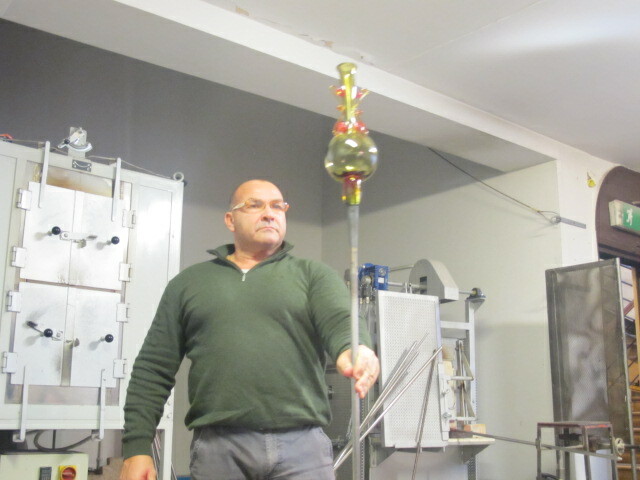 Venice is famous for it’s Murano glass, so I’d advice seeing a glass blowing demonstration. It’s outstanding. I stuck to my pocketbook and bought a two charms for my Pandora bracelet – setting me back a mere 30 euros. 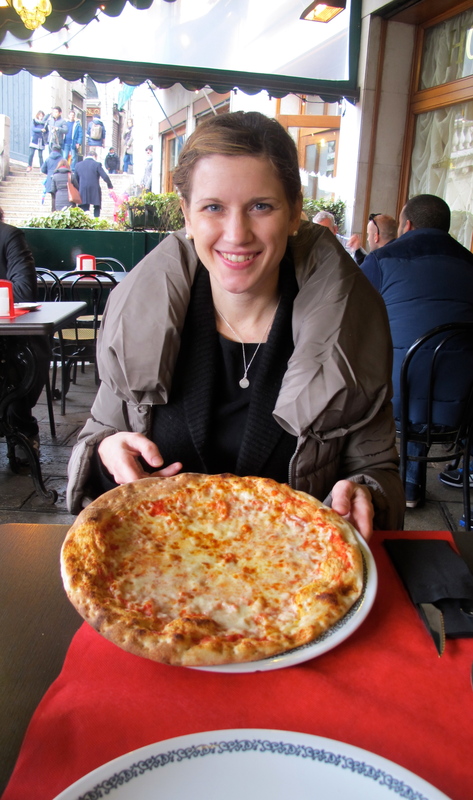 In travel, I love to learn about and experience regional foods and drinks. 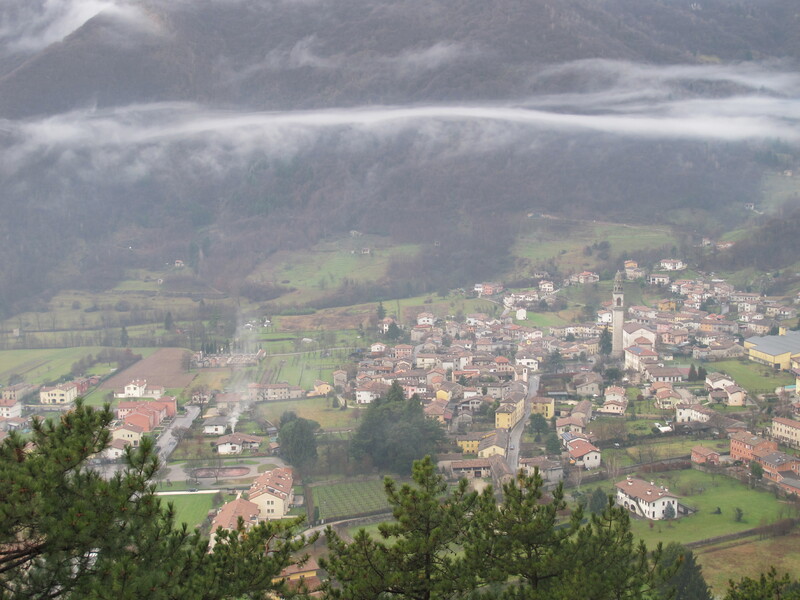 Our ACIS travel guides taught us a lot about Italian food culture, such as Italian names for pasta shapes: Mother-in-law tongues and priest stranglers. I learned several life phrases based on food: If you are fed up – you are at the fruita because they fruit comes further down the meal. You can say che pizza if someone/something is boring. If you eat well, you are a good fork, or buona forchetta. And ate well we did. I ordered up a regional specialty, the spritz, served with a snack of hazelnuts, beet chips and spicy chips. 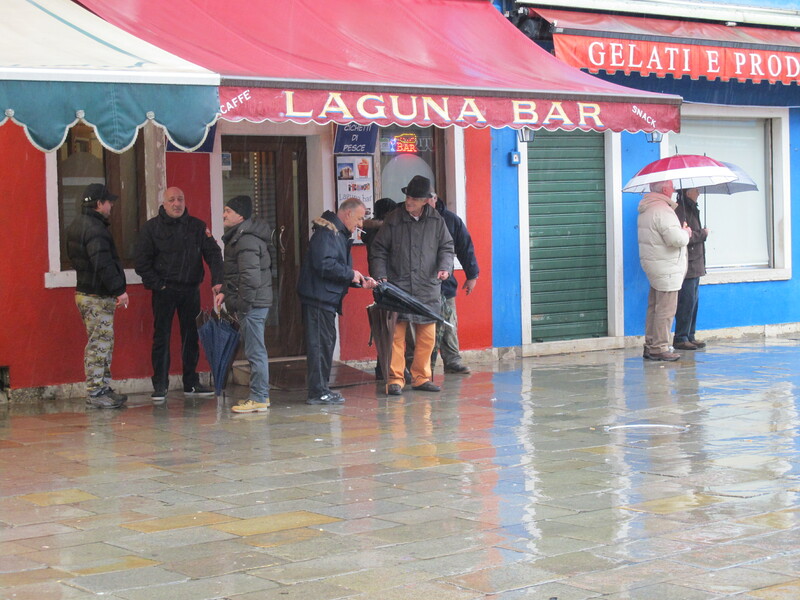 When visiting Venice, I recommend taking the vaporetto, which is the Venetian water bus, to nearby Burano. 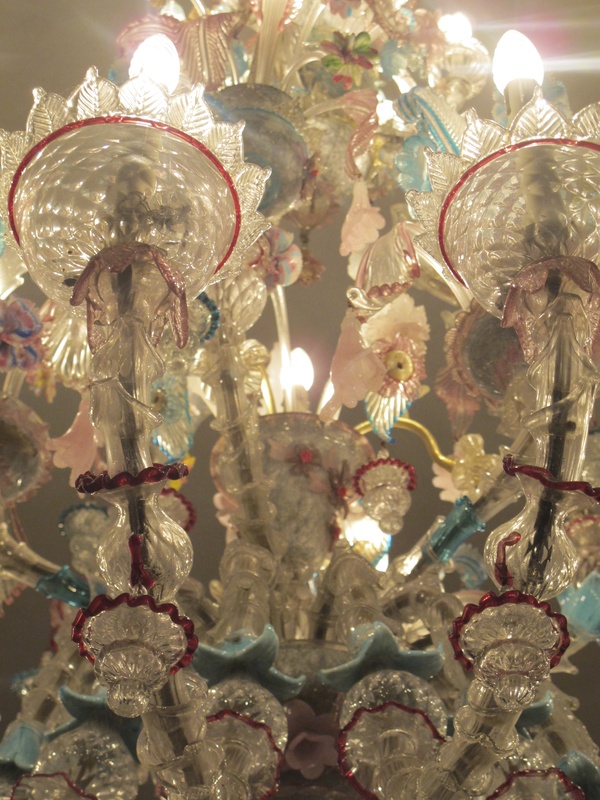 The fishing village known for artisan lace. And it’s colorful houses. Lore is the village painted the houses in vivid colors so the fisherman could navigate home in the fog. Traditionally while the men were out fishing, the women were home tatting lace. We ate a fantastic seafood lunch (pasta frutti di mare!) at Gatto Nero, or black cat. Anthony Bourdain talked about this restaurant on his show No Reservations. It was Friday the 17th, which in Italian culture is considered unlucky. When 17 is written in Roman numerals – XVII – the X crosses off the VII, or the life. Unlucky. Black cat. Oh no. The worst luck we had was rain, which was actually picturesque. And we could not stop taking pictures of buildings. 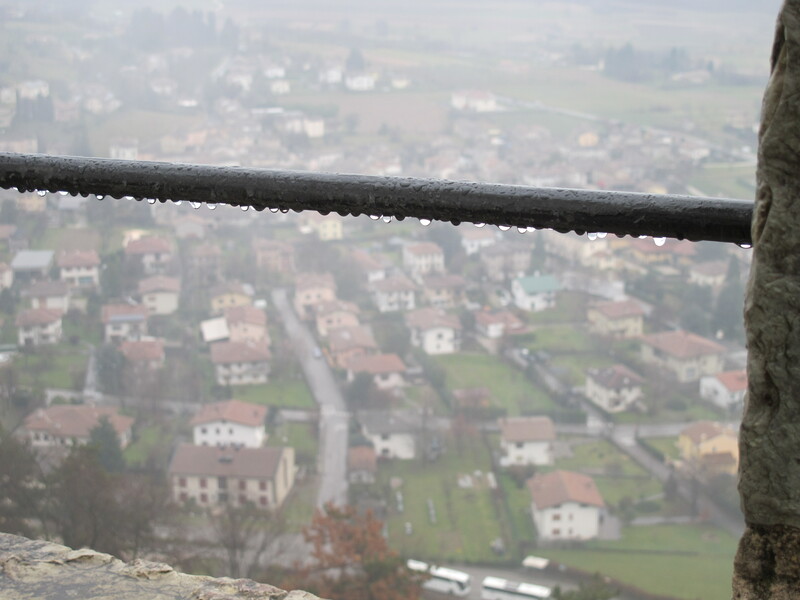 It was an amazing experience to stay in a castle, in the mountains 1.5 hours outside of Venice (at 11,000 feet). 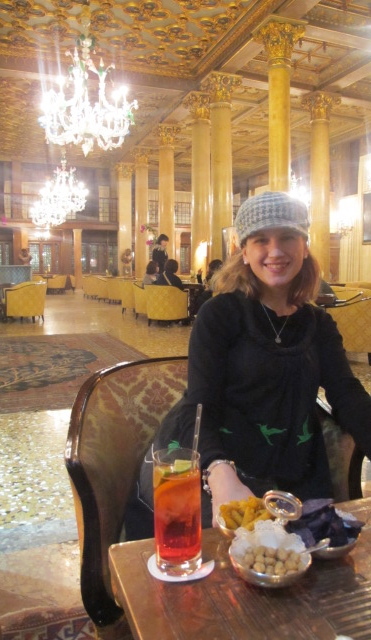 ACIS, the travel company I use for student travel, knows how to do it up in style. At the castle, we enjoyed a Turkish spa and a medieval dinner performance. And plenty of Prosecco. 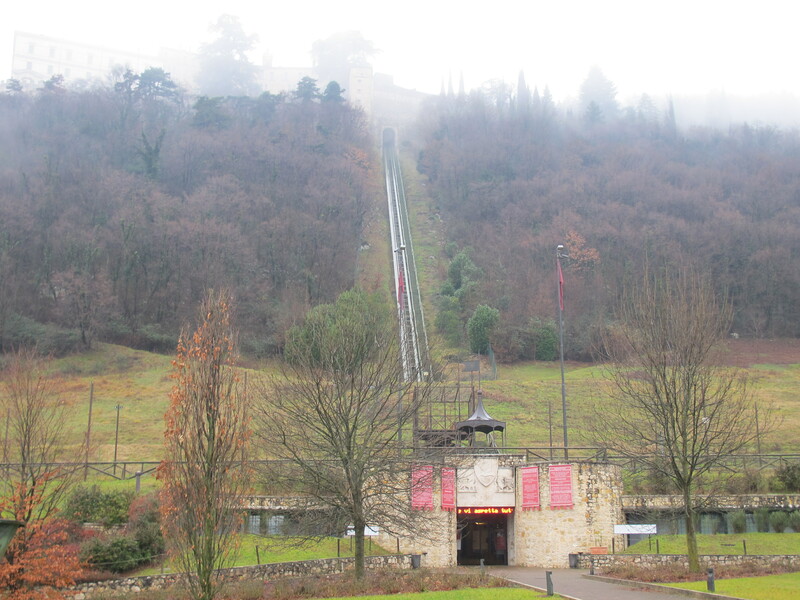 The misty mornings made the castle feel a wee eery, but there was not a ghost, in case you are wondering … my students asked me about les fantômes. When traveling, getting off the beaten path is an aim of mine. 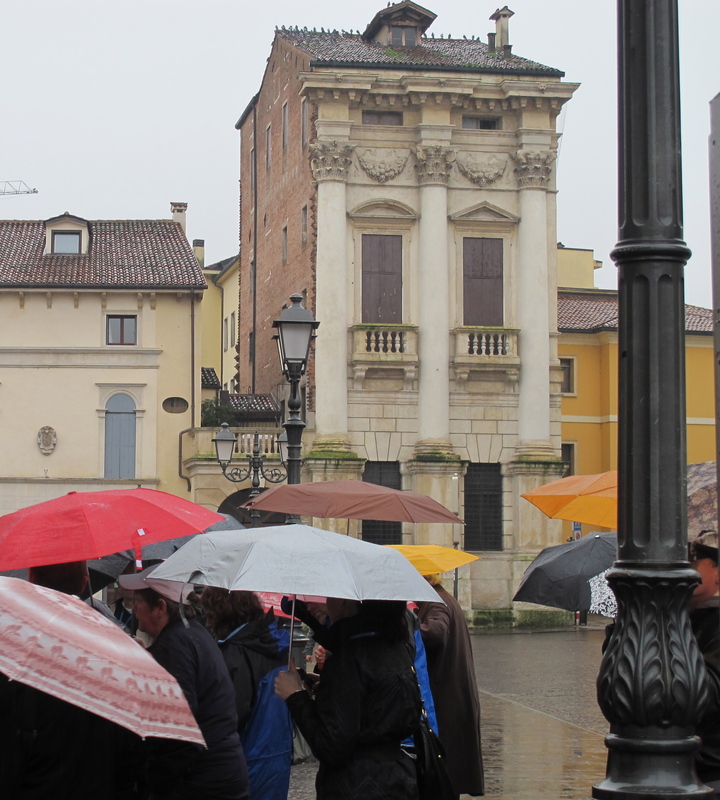 Our ACIS tour guides took us to Vicenza, home of the legendary cat eaters. 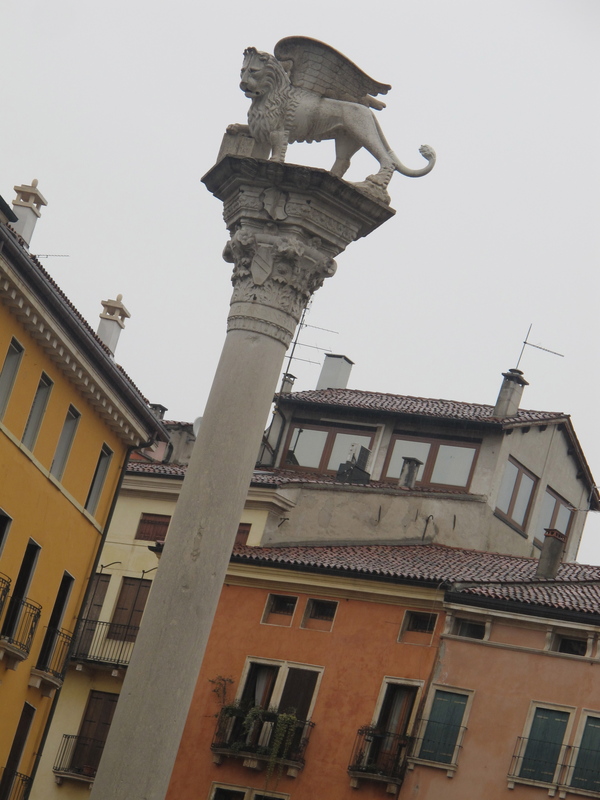 In Vicenza I learned what the lion statues symbolize, and why there are winged lions everywhere. The key read is if the book was open or closed and the lions tail was up or down. Open = good; up = good. Book open and tale up = it’s a time of peace! Residents had ugly masks above their hearth to keep away the bad spirits. We all know Romeo and Juliet. 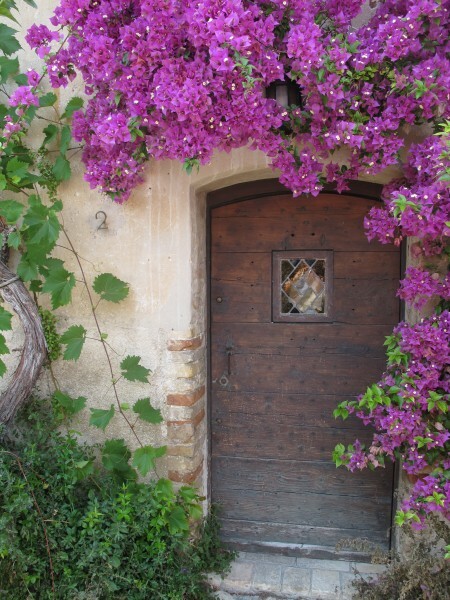 Although, the story is set in Verona, the author was from Vicenza. 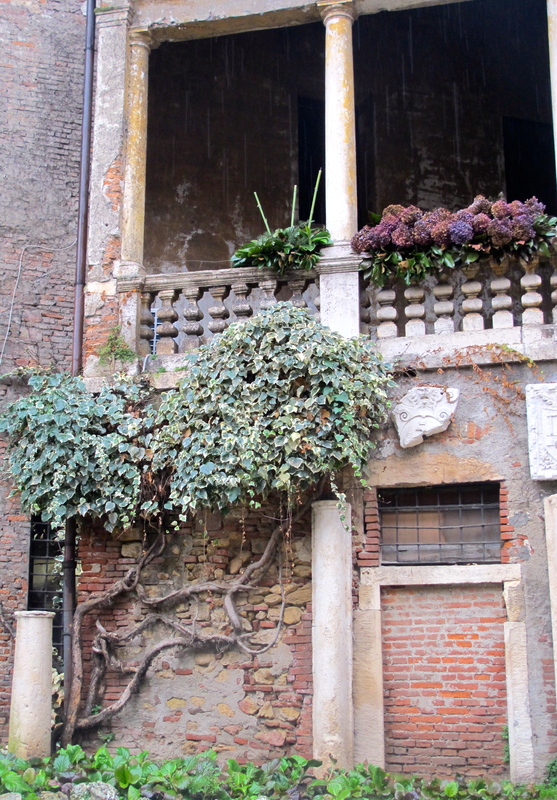 Pictured here was his inspiration for Juliet’s window. The best part of traveling to Europe in January and July are the sales, saldi! 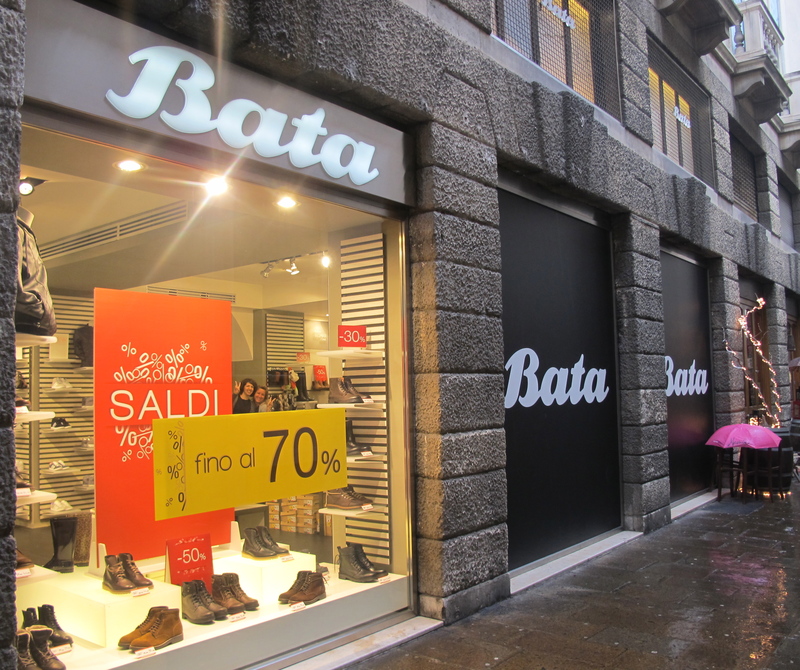 Check out the funny gals in the window after we dropped some euros at Bata. They were so helpful offering my friend and I tips on where to shop and eat. And humored me as I practiced my Italian. Lastly, I get a kick out of photographing the unusual. We connected flights in Frankfurt, and this was our first view in the airport. Yikes! 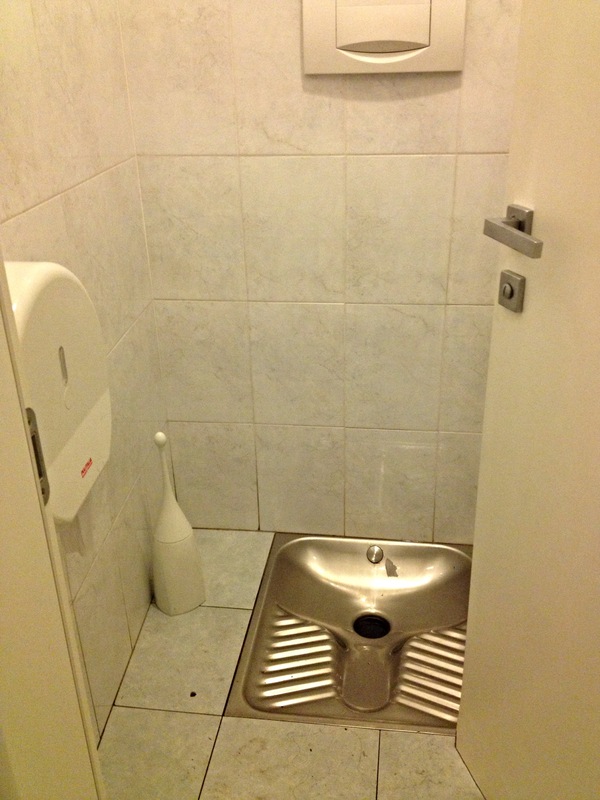 And standing toilet at Bar Castillo in Vicenza. At first I thought it was for the gents, but nope, ladies too! Hope you have good aim. 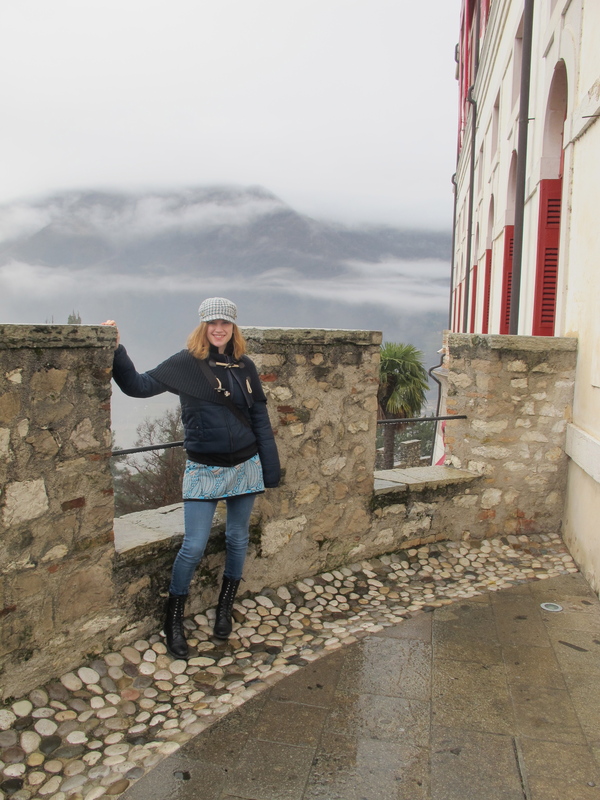 Overall, Italy ticked off all the boxes – food, fashion, art, history. I’m so grateful to ACIS for this amazing! travel experience. Their company slogan is travel changes lives.